I was recently at the graduation party of a young friend of mine who majored in Psychology. As part of her party fun, she offered her invitees an opportunity to take the Myers-Briggs Personality Type Indicator, and wear our types on our name tag. In case you haven’t heard of the Myers-Briggs, it was developed so that people might have more direction in career selection and success, and learn how that might be impacted by personality type. Myers and Briggs believed that the more people could understand each other’s differences, the better they could work and live together. It’s important to note that no personality type is judged as better than another; rather it is a collective data point, if you will, of how one views and interacts within his/her world. Additionally, even though one might be rated as a certain personality type, there is a range, rather than a specific pinpoint within each scale. To clarify, I am considered an ‘extrovert’, but I missed being an introvert by merely a couple of questions. Yeah, okay, I’ll tell you mine. I’m an ENFJ. This stands for: extrovert (vs. introvert); intuitive (vs. sensing); feeling (vs. thinking); and judging (vs. perceiving). This may shock no one, but my husband and I scored nearly opposite on this inventory. With the above in mind, I have a question for you: Are you a go-er or a wait-er? Do you have to think about something, mulling over every last consequence and action, or do you gather a minimum of information and dive right in? As with the Myers-Briggs, I don’t think there is a correct answer. In fact, I know there isn’t because God wired us all sorts of different ways, and He’s an amazing Creator. It’s brilliant the way God used different types of personalities to achieve quite different, but equally Kingdom building goals. God said to build an ark because there was a coming flood that would wipe out world. Noah built while his neighbors and friends must’ve laughed at him and thought him mad. Now, Abraham did wait upon God for a very long time (in human terms) to become a father, but when Isaac was a young boy, God tested Abraham’s faith. God told him to sacrifice his son to prove his faithful obedience to God. While Abraham was in the process of wielding the knife over Isaac’s body, God intervened, and provided a ram in a nearby thicket as a pleasing sacrifice, rather than having Abraham kill his promised son. Aaron made some mistakes (like the gold calf incident) because he didn’t wait upon God enough, and caved in to the demands of the complaining Israelites; but he stepped up to help his reticent brother (Moses! ), and was the first priest of God’s Tabernacle. Ruth was a widow, and accompanied her mother-in-law, Naomi (also a widow) back to Naomi’s ancestral land of Bethlehem, from Moab, where they had been living with their husbands before they died. Had she not gone to Bethlehem, she would not have married Boaz, and would not have been in Jesus’ ancestral line. (Jesus’ earthly father). Joseph took on an unwed teenaged bride with very little (and quite unusual) information to go on. He obeyed the visions he was given regarding Jesus’ parentage and the family’s safety. He kept Mary and Jesus safe because of his willingness to go. Now, disclaimer: Jesus knew what he had been sent to do, but still. His whole ministry was spent going, doing, teaching, praying, and going on some more. Yes, Moses. The most accepted author of the Pentateuch, the man who led God’s people out of Egypt, was reluctant to go. There was a long discussion between him and God about how he didn’t feel qualified to speak to and lead such a crowd – to the point where he made God angry. But God met him more than halfway. Yes, He rebuked Moses for his hesitance, but gave him Aaron to help with the speaking and leading. Is there anyone else who waited and WAITED more upon the Lord than Job? Time after time, God allowed Satan to punish and torture him, while Job waited upon God’s answer, and lived his belief that no matter what happened, God was still God, and He would always be good. Esther’s timing with how she approached King Xerxes regarding the freedom of the Jewish people was intrinsic to them being set free. Had she panicked and rushed telling the truth to Xerxes regarding the evil Haman, the events would not have unfolded as they did, resulting in the freedom of the Jews. Perhaps Mary is within the range of being a wait-er, but nearly a go-er. But from what I read about Mary, she was thoughtful, and likely introverted; and while she accepted Gabriel’s message and her fate with open hands, we know she also pondered so many things in her heart. Yes. He’s both because He’s everything, no? He waited to come down to save humanity until God sent Him. He waited upon his disciples to follow Him and understand His message. And He waited for death upon the cross. Why should we care who’s a wait-er and who’s a go-er? It’s a little silly-sounding, I grant you. Sometimes I think we listen to the lie that we aren’t up to the task of serving God just the way we are. Man, it’s so stinkin’ easy to listen to the enemy’s whispers of not enough. Friends, God made us enough! Let me encourage you to embrace your type, whatever it is, because it’s uniquely YOURS and it matters to God. So, which are you? And do any wait-ers or go-ers come to mind from your Bible reading? Grace & Such strives to advance Christian growth among women. While we believe the Bible is the inspired Word of God, we also recognize human interpretations are imperfect. Grace & Such encourages our readers to open their Bibles, pray for wisdom and study for themselves what the Word says. For more about who we are, please visit the About Us page. Gretchen has blogged for more than a decade, usually tying her faith to her reality, and has guest posted or written for Believe.com, JeanPSullivan.com and other blogs. 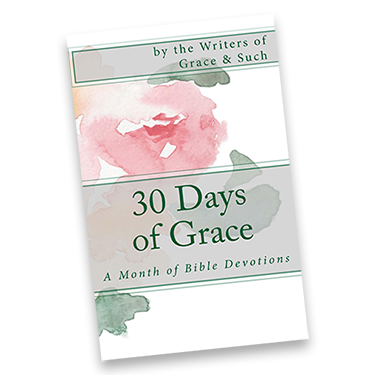 It’s her honor to be among the writers on Grace & Such, and she is currently not only found here and at Musings with Gretch, but is also holding hands open for other writing (blogging and otherwise) and speaking opportunities as she waits upon God’s unfolding plans for her. Sarah, thank you for stopping by. Yes, so important to listen to what our part is in Kingdom work– it may or may not be what we thought we would do or just like someone else. But it’s uniquely ours. Peter, the go-er, always comes to mind. He had no fear, but often regrets about his impulsive ‘go-ing’, YET, Jesus built his church upon this impulsive go-er, this guy who just went. As a natural go-er, I learn from his example how to have that holy sorrow that comes from go-ing when I should have been wait-ing. Though, over the years I think I’ve mellowed into a waiting go-er. I go with more confidence, and know, more often, when to wait. Thanks for pulling in a powerful, secular tool into your teaching. Such a great perspective on living out our faith no matter where we are. I’m trying to be more of a waiting go-er, as well, because personalities can always be tempered for the better with wisdom and experience. I’m a wait-er all around, except when I’m not. I “ponder” to the point of avoidance (if that makes sense) and I need to be more of a go-er. Except when I go without waiting for God. Hi Jenni. I think sometimes I ponder too long out of a perfectionism trap. Will I do it right? Am I the one He’s looking for. So hard to step outta the boat in faith sometimes. I know I need to be more of a wait-er, too, but when called, I need to go. So interesting! I *love* the Myers-Briggs. The first time I took it, in college, was one of those life-changing moments. A weight lifted, and I realized, “Oh, that’s why I’m having such a hard time with _____.” I thought I was just undisciplined :-/ I think every church should consider offering the test for church leaders; it’s so helpful to see where everyone is on the beautiful scale. We are truly one body with many members, all crucially important. Thanks for your comment, Cole! Yes, I love the Myers-Briggs, too, and it would be cool to see churches offer it, similar to how (or perhaps in tandem with) they offer spiritual gifting inventories. It’s fascinating to me to see how we’re all wired so similarly in some ways, yet so differently in others. I suppose the down side is that some folks would avoid growth because of their label; however, it’s nice to know how best to love on others based on who they are, not just who we think they might be.